Should is a frequently used word and not typically in a kind way. The way you communicate with yourself and others can be supportive or devaluing without fully realizing the impact of our word choices. In most circumstances, “should” leads to judgment, criticism, worry and even anxiety. I have become more aware of my own frequent use of “should,” and very aware when I hear it said in conversations with my friends, family and clients. This little word transports us back to the past and replays situations where we were judged to be lacking or not good enough. Should contributes to self-sabotage in our inner dialogue and chatter, keeping us from being mindful and present in the moment. Honestly, no one feels good when they are told what they should do. “Should’s” power is subtle and it eventually undermines self-confidence and self-worth. One day, a client came into my office and mentioned a bumper sticker that reminded him of a prior session’s conversation. The bumper sticker simply stated, “Stop shoulding on yourself.” He and I laughed that day and we continue to take this simple message to heart. Here are three steps to stop “shoulding” on yourself and start making positive shifts with how you communicate to yourself and others. Increase awareness and notice how often this word pops up in conversations, classrooms, business meetings or even in your internal critical language. It may be more often than you realize. Don’t judge. The goal is to look at how we can move forward and intentionally choose to do things differently. Bottom line – Acknowledge a mistake, Learn from it and Let it go (ALL of it). 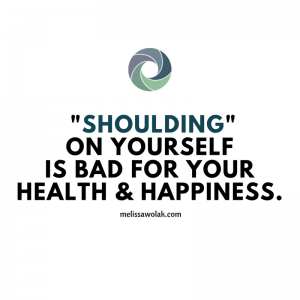 No more “shoulding” on yourself and subtle judgements. Be “kindful.” Lessen the use of “should” to consciously make decisions and change unkind habitual ways of talking to yourself and others. LOVE this article. I’m going to take “should” out of my vocabulary!